It’s official, I now say that Doodle MPB is the biggest mistake of my life. Now, I also recognize that getting a crazy puppy with a 2 year old is probably not the worst possible mistake people make in their lives. For example, I could have made a decision to start smoking crack-cocaine (or is it inject crack-cocaine? I really don’t know. I’m not experienced in crack-cocaine). Clearly, I could have made a worse decision. So, maybe in the scheme of life, this being my biggest mistake is not the end of the world. If we advertise on a public buy and sell site (i.e. craigslist), and am truthful about her personality, the only person who would be willing to take her would be someone running a dog fighting ring (they would probably love to have her for all the wrong reasons). So, this is clearly not an option. If we take her to the city pound, she would be adopted immediately because she is just so darn cute. But, it’s just not an option because she’ll either be destined to a life of continual abandonment as people would return her every 3 months due to her crazy or she’ll end up with someone who gets frustrated and ties her up outside all day and basically abandons her. Again, not an option. (There is a third option, which is actually driving half way across the continent to take Doodle MPB to Belladonna Took, who will take her and find her the right home as she runs a small dog rescue – but that is an absolute last resort, to the point that we are not even considering it. That said, I’m thankful we know we have an out if we truly get to that point). But, in the meantime, our vet has determined we have tried everything she can think of and suggested we try medication to help her. So, as of yesterday, Doodle MPB has started what I am calling puppy prozac. In reality it is called Clomicalm. I asked our vet what to expect, and I loved her description. We are not trying to change Doodle MPB – she is a lovely dog. We are just trying to take the edge of the crazy. So, we are trying this for a month. I’m told it will take at least 1 week before we notice any change. And in 30 days, we will either alter the dose or try something else. The thinking right now is that she’ll stay on this for the next year or so, and then we’ll try weaning her off of it. But I am told some animals will need it for life. Only time will tell. OMG, cat pee is literally the worst smell in the world!! I cannot even imagine the smell of cat pee in my house! And I think it’s hilarious that the cat was framing the dog. Prayers that the pills take the edge off the crazy and that you can all enjoy Doodle MPB! Thank you my friend. I’d give anything to just have a normal puppy. Pretty sure you smoke crack…but what do I know lol. I hope the puppy prozac works. You guys have put so much time, effort and money into her and you deserve to actually get to enjoy your dog. I hope the vet felt confident that it would help him. If it doesn’t work, which I’m really hoping isn’t the case, have you reached out to the breeder to see if they would be willing to take her back? I know some breeders are ok with that if it means that one of their dogs don’t end up at shelters or in rough situations. Our breeder made us sign a contract stating that if we ever couldn’t handle having our dog anymore, we have to return her to the breeder. We thought it was a weird stipulation to have, but when we started to have our own challenges with her, we totally got why she would ask of this. “pretty sure you smoke crack” – do you mean me actually smoking it, or the figurative you, as in people smoke crack? Either way, I can confidently say I don’t. Maybe other people do? HAHAHA! lol lol oh my goodness I didn’t realize how that line came across! lol it was meant in the figurative way! like “those who do crack smoke it”. I’m actually laughing hard over this now! ohhh yeah i remember that now. damn. seems a little crazy that someone who wants to breed dogs, even if it’s just a once a year hobby thing, won’t accept responsibility for the dogs that they are putting out into the world and are potentially going to fill shelters with. If anything, they should at least help their adopters re-home the dog if it doesn’t work out. I could go on a rant about this but I will spare you from it 🙂 It’s tough to learn these things along the way. We landed ourselves in a situation where we were almost stuck with a dog that was clearly not a match with our family and the rescue group that we got him from wouldn’t take him back. The dog destroyed our home, furniture and ran away causing us to spend an entire long weekend searching for the dog who we knew wouldn’t come to his name being called. It was a giant mess. We ended up threatening to get lawyers involved if the rescue group wouldn’t take him back. Obviously not suggesting you do this though. We were in a dire situation where we owed about $1,000 to our landlord and our neighbour because of the dog. I’m really hoping that the doggy prozac is helping and you guys are getting a tiny glimpse into what a good life could be like with her. Really hoping you will! I learned a very important lesson about going with a non-breeder. I doubt we’ll ever get a breeder dog again, but if I do I will pay way more and go to a real breeder! Like everyone else, the crack comment “cracked” me up. 😂 I think it’s snorted but who knows! Certainly don’t want to try it. Lol. I hope this med takes more than just the edge off of Doodles crazy. Hopefully it’ll make the crazy all gone and she’ll just be a normal dog. 🙂 And I totally get why re-homing her is not a good option for you guys. I wish you all the best! 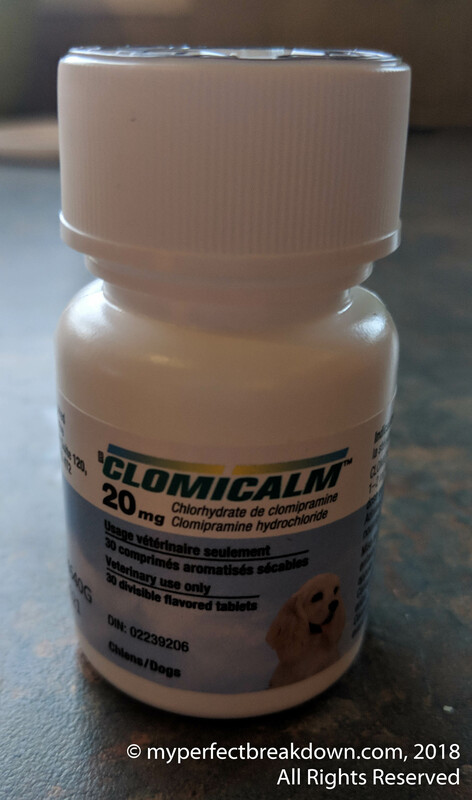 The doggy drugs do have me pretty optimistic that we’ll get a normal dog in about a month’s time. But, only time will tell. I’ll definitely let you know what happens. I sure hope it does!! Definitely do keep us updated. I so hope you will finally get to enjoy your doggie! This is so hard and I’m sorry it hasn’t improved. If it comes to it and you need to Rehome please do option 3. Yes, that does sound difficult but it would be the best for her. I hope the puppy pulls help. If this gives you any comfort, in my experience, dogs tend to calm down at about 2 years old. When my blue heeler hit the 2 year mark, he settled down significantly. He’s still had the random behavioral issue, but it was nothing compared to that first year. I didn’t even know this existed. Good luck to you. There is a chance that she has had a negative reaction to vaccines. They can cause behavioral issues in dogs, among other things. A holistic vet should have some ideas and protocol for helping her. That dog sounds crazy crazy! I hope the meds help. I would’ve gotten rid of it a long long time ago. This sounds so difficult! I’ve been following along with your dog posts with sympathy. We got a puppy (and 3rd dog) this year when our toddler had just turned 1. Luckily, things are working out really well (we also have about 15 baby gates and a crate in the living room and he has hour long off leash hikes every day and another dog to play with). I know you’ve had lots of vet and trainer advice but I’m so curious about what Doodle’s main issues are (I also work as a dog trainer). We see a lot of super bouncy energetic doodles in classes but she sounds like is she above and beyond that. From what you’ve written I would recommend rehoming with the help of a trainer to do a home check and to make sure everyone is on board with a lifetime of training. It is crazy to get a puppy when you have a toddler…but I know from experience that it doesn’t have to be so awful and it can work with the right dog (and a ton of training/management). Good luck! I reeeeeally hope this does the trick for you. Well, unfortunately for her crazy, I think she was destined for you. Not many people would even consider keeping her based on the realities of her future if you don’t. A lot of people would shelve those thoughts, get rid of her anyways because they cannot deal. I give you all the credit in the world, because I do understand how frustrating an anxious dog is, and ours isn’t NEARLY as crazy as Doodle. So hats off to you! Also, I’m glad that your vet understands the reality too and is willing to work with you and Doodle to try to get her to be calmer. 🤞🏼 this stuff works!!! I’m just catching up after losing track of your blog for a few months and wanted to second (or third or fourth) the people who have commented about using brain games to tire out Doodle MPB. As a bit of backstory, our dog was BONKERS when we adopted her from a rescue at 10 months (high energy, high anxiety and massive abandonment issues due to having no training and five homes before ours) and there were certainly many days where I was reduced to tears thinking she would never, ever be a good dog. Crate training, brain games and consistent exercise were the key elements (though we honestly weren’t opposed to medicating if it came to that) that eventually led to her good dog status. Brain games are particularly useful during the winter when it’s -30C outside and nobody wants to be outdoors for longer than absolutely necessary. I’m a huge fan of making her work for her food in ways that don’t also mean I have to hand her each piece of kibble, so I do a lot of food rolled or folded into blankets or sprinkled into a big tote box filled with our paper recycling. She is honestly exhausted afterwards. Smart dogs can also be taught to bring you specific toys, such as “red ball” or “antler” or “green tug” and that’s a pretty fun party trick to work on when I’d rather be inside than out. Kudos to you guys for finding ways to make it work! So many people just give up and the dogs end up suffering because of our mistakes. Also thank you for repeatedly pointing out the downsides of buying from a backyard breeder!